On these hard wooden chairs in the air conditioned oasis of Mepkin’s sanctuary, I took refuge from the 111 degree heat index and the blanket of silence that draped over the weekend, like auditory humidity, like shaggy Spanish moss, ubiquitous and moody. I woke at 5:15 to stumble in the still and warm dark to this spot, to listen to Psalms lifted up by gentle tenors. I returned at noon to listen again, more voices, more song, more prayer. And again for Vespers, then Compline, and in between, in the day’s long stretches of sunshine and heat and not enough breeze, there were no voices. No words. At meals the only conversation was the clinking of silverware on china, the screech of wooden chairs pulled in and out under the tables. For two days, no one knew or said my name, no one asked me anything, or asked of me anything. There was only time, open and unspoken. I am a lover and seeker of silence. In the car, I often turn off the radio. I do not open Pandora’s music box when on the computer. I mute the TV. My husband, on the other hand, will idle in the driveway for several minutes — even if we are running late — while he loads up his playlist. When he comes home for lunch, the first thing he does is turn on his mp3. While cooking dinner, it’s Miles Davis or Bill Evans. My mother, too, craved noise. She always had the TV or radio on. Always. When she went out to run an errand, she left the radio on for her cat — projecting her need for music and words on to her kitty. I often worried what would happen if Mom’s ALS progressed to the point where she would come live with us — not because I feared the heavy-lifting of caretaking, but because I wasn’t sure if we could share the same sound environment and not go crazy. In her last months, my time with mom was spent on high auditory alert. If I wasn’t right beside her, and even when I was, my ears were tuned in for the slightest sound of choking, for any noise that suggested she was trying to get up from a chair or reach for something. As I soak in the luxuriousness of Mepkin Abbey’s cloistered quiet, I wonder if the inner dialogue gets louder, or lonely, after days and years of vowed voicelessness. And what it must have been like for my mother, and others, hushed not by holy vows but by helpless vocal chords. I am haunted by her silenced voice. By what was left unsaid, unheard, what I should have listened for but did not, could not. By the sweet memory what I could hear: the tiny high-pitched squeal, barely a noise at all, that was her laugh. The labored puff of air forced through an unmovable jaw, the small, scared groan. The voices of Regis and Kelly in the background, the volume, always, turned up. ~ by Stephanie on 08/01/2011. audidtory humidity. Yes, that says it exactly – what I felt yesterday, and often on these summer days. shaggy and heavy like spanish moss. you were brave to enter the silence, then, and to hear the noises that were there. thank you for talking about them. it evokes much in me. 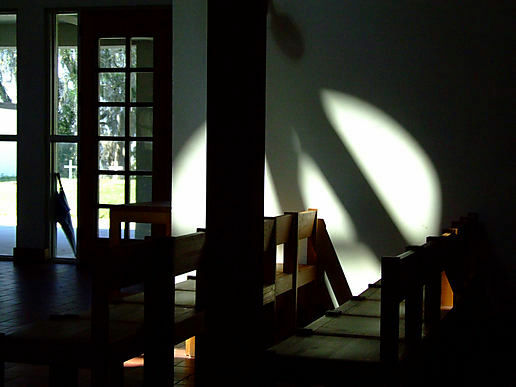 Your piece reminded me of days at Holy Cross Abbey in Berryville, Va and my experience of silence that left me troubled as I returned to a life too busy, too noisy for attention. My mother also lost her voice the last two years of her life, but I found I relied on her facial expressions of delight at beauty, at the approach of her husband though she did not know it was he. I grieve still for the words we were never able to share during those years of watching her life close in on her. Now I need to make reservations to return to the Abbey. Stephanie – the beauty of the words you write come from the silence you permit yourself. 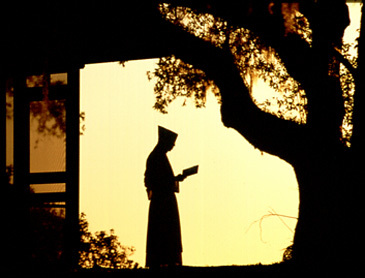 Mepkin Abbey sounds extraordinary, as are your words. I don’t think I’ve ever read a piece of writing like this — so powerful and calm and desperate, all at once. Stephanie, your writing is so beautiful, so evocative. You capture the situation, your feelings, your Mom, and your wise observations in such a touching way. I hope the process of writing is as healing for you as it is for others to read your work.